Fur goods have been withdrawn from a cathedral Christmas market after online abuse against the stallholder "got out of hand". The abuse targeted a stall selling rabbit fur garments on Exeter Cathedral green. 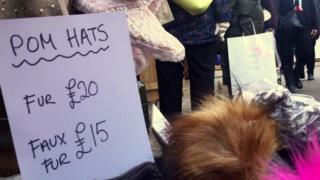 The cathedral said in a statement it had asked the fur to be removed "for the safety" of the stallholder. The stallholder, who did not want to be named, said the abuse "went viral and it got out of hand". She said the fur was a "by-product of the rabbit meat industry from France" and "comply with UK law". The stall is now selling only fake fur products. "We took off the products as they were upsetting a certain group of people," she said. "I have been selling them at the Christmas market for four years and never had any trouble before." Mark Gold from Exeter Friends For Animals said it was "really regrettable" that the cathedral had been allowing fur at Christmas, "supposedly a time of peace and goodwill". He said: "High Street stores have banned it and yet a higher moral authority like the Church is allowing it."